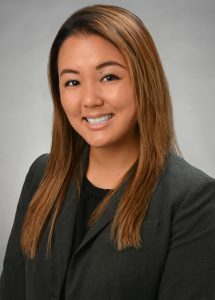 Tawnee Sakima, an associate with Ashford & Wriston, was admitted to the Hawaii bar in 2014 and joined the firm in 2018. Tawnee is an associate in the firm’s Family Law department. She is licensed to practice before all courts in the State of Hawaii and the United States District Court for the District of Hawaii. Tawnee is a member of the Hawaii State Bar Association’s Family Law Section. Prior to joining the firm, Tawnee served as a law clerk to the Honorable Judge Randal K.O. Lee of the First Circuit Court, from August 2014 to April 2015. Tawnee was also a Deputy Prosecuting Attorney for the City and County of Honolulu for over two years. As a Deputy Prosecuting Attorney, she specialized in prosecuting domestic violence felonies and representing victims of domestic violence. During law school, Tawnee worked at the Legal Aid Society of Hawaii and represented clients at the Child Support Enforcement Agency administrative hearings. Tawnee also externed at the Honolulu Department of the Prosecuting Attorney, Domestic Violence Misdemeanor Division. Tawnee has been a member of the William S. Richardson School of Law Alumni Bruzer Football Team since 2014. She is also a coach for Special Olympics Hawaii for soccer and track & field.